This document helps familiarize you with Novell Filr and helps you quickly understand some of the most important concepts and tasks. For more information, see Accessing Filr in the Filr 2.0: Web Application User Guide. Share a file with User A and grant Read-Only access. Share the same file with User B and grant Edit access. View what has been shared with you and by you. Collaborate through comments on shared files. Users with the share can see comments and make comments. For more information, see Commenting on a File in the Filr 2.0: Web Application User Guide. 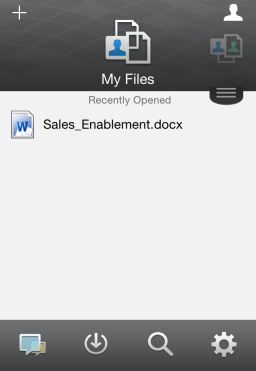 Net Folders provides access to your organization’s file system. Your Filr administrator defines which Net Folders you can see and the sharing rights you have in them. For more information about Net Folders, see Accessing Files and Folders in Your Organization’s File System (Net Folders) in the Filr 2.0: Web Application User Guide. Personal Storage for files and folders that you want to upload directly to the Filr site. Your Home Directory on your organization’s file system. Files and folders that are located in your My Files area are visible only to you by default. Your administrator determines your My Files sharing rights. 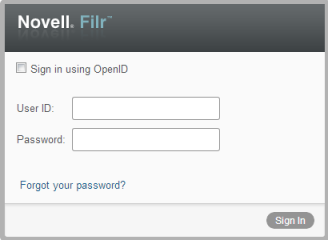 You can access Novell Filr from a web browser as described in the Filr 2.0: Web Application User Guide. You can access Filr directly from the file system on your computer (Windows or Mac). For more information, see the Filr Desktop Quick Start for Windows and the Filr Desktop Quick Start for Mac. There are native iOS, Android, and Windows Phone mobile apps for accessing the Filr site. Accessing Filr through a web browser on a mobile device is not supported. Instead, download the Filr mobile app that is compatible with your mobile device. For more information, see the Filr 2.0 Mobile App Quick Start. This example shows Filr on an iOS device. The look and feel differs on Android and Windows devices. In addition to starting Filr from a web browser as discussed in this section, you can also access Filr from your desktop or from a mobile device, as described in Accessing Filr from Your File System and Accessing Filr from a Mobile Device. Go to the URL of your corporation’s Filr site. In the User ID field, specify your Filr user name. In the Password field, specify your Filr password. If you do not know your Filr user name and password, contact your Filr administrator. The Forgot your password? button applies only if you are an external user (you were invited to the Filr site through an email invitation). If this is your company’s Filr site, you are most likely an internal user and you cannot change your password by using this feature. When you first launch Filr in a web browser, you see the My Files page. You can manage all of the files that you have created from this page. People: Click the People icon to see a list of all users in your system. What’s New: Click the What’s New icon to see an up-to-date view of the latest changes that are happening in the Filr site. Use this area to view the latest changes to documents that you have access to. New files and modified files are displayed here, along with information about which users modified the files. My Files: Manage all the files that you have created. Shared with Me: View all the files that other users have shared with you. Shared by Me: Manage all the files that you have shared with other users. Use this area to manage the rights that other users have to the files that you have shared with them. You can revoke rights, grant additional rights, and so forth. Net Folders: View all the files and folders that you have access to on your corporate file system. Public: View all the files and folders that have been shared with the public. This area is available only if sharing with the public has been enabled for the Filr site. Data Quota information: (Conditional) Your current data quota and the amount of your quota that you have used are displayed. If this option is not displayed, the Filr administrator has not restricted you to a data quota. 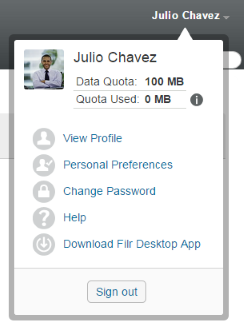 For more information about data quota in Filr, see Managing Your Data Quota in the Filr 2.0: Web Application User Guide. View Profile: Displays your Filr profile. Items per Folder Page: Specify how many files you want to appear on a given page. For more information, see Configuring the Number of files to Display on a Folder Page in the Filr 2.0: Web Application User Guide. When clicking a file: Specify the default behavior when clicking a file name. For more information, see Changing the Default Behavior When Clicking a File Name in the Filr 2.0: Web Application User Guide. Hide ‘Public’ Collection: Select this option to hide the Public icon in the masthead so that it is no longer displayed in the web client. For more information about viewing files that have been shared with the public, see Accessing Public Files and Folders in the Filr 2.0: Web Application User Guide. Define Editor Overrides: This feature lets you change the default editor settings for editing files. For more information, see Unable to Edit Files in the Filr 2.0: Web Application User Guide. Change Password: Specify your current and new password. Help: Displays the Filr Web Application User Guide. Download Filr Desktop App: (Conditional) Displays the Filr desktop app download page. If this option is not available, the Filr administrator has not enabled it. Sign out: Signs you out of the Filr site. Search Field: A global search that searches all content within the Filr site, including file metadata and content within files. The Content Area in Filr is where the majority of information is displayed. Only local and external users can change their passwords as described in this section. If you cannot change your Filr password as described, contact your Filr administrator. Click your linked name in the upper right corner of any Filr page. Specify your current password, then specify and confirm the new password. You might need to manually update your profile in order for important contact information to be seen, such as your email address, phone number, and picture. Click Edit, make any necessary changes, then click OK. This information might not be available for you to modify if your information is being synchronized from your corporate directory. When you update your profile picture, the updated picture can take up to an hour to be updated in the Filr mobile app. Do not change this setting; it is overridden by your browser time zone setting each time you start Filr. This changes the language that Filr is displayed in when you access Filr on the web. If you have a phone number specified in your profile, you can elect to have file subscription notifications sent to you via text message, as described in Subscribing to a Folder or File in the Filr 2.0: Web Application User Guide. If you are unable to edit any fields, it is probably because they are being synchronized from your corporate directory. Filr displays the Web Application User Guide in a new browser window.